The stunning Las Colinas Golf Resort and country club, has again been voted Spain's number one golf resort, for the second year running. It has also picked up the award for the best Villa resort. As you enter the secure gated resort, and come over the brow of the entrance hill, It really isn't hard to see why, Las Colinas Golf Resort is so popular. Set in Campoamor, in the south east region of Spain, This stunning resort has been thoughtfully laid out, over the 3,300,000 sq m, area of natural green woodland, and forests. Access to Las Colinas Golf Resort & Country Club, is managed with ease, as all the region's Airports, are within a short drive, of the resort. San Javier, Murcia (15 Minutes). Alicante International Airport (45 minutes). One of the resorts main attractions is the 18 hole championship Golf course, sits within this beautiful landscapes and features some stunning lakes, and challenging golf holes. The Las Colinas Golf Resort and Country Club, also plays host to the European Tour Qualifying School, and a host of other tournaments, from various, countries. With Golfers from all corners of the globe visiting the resort. 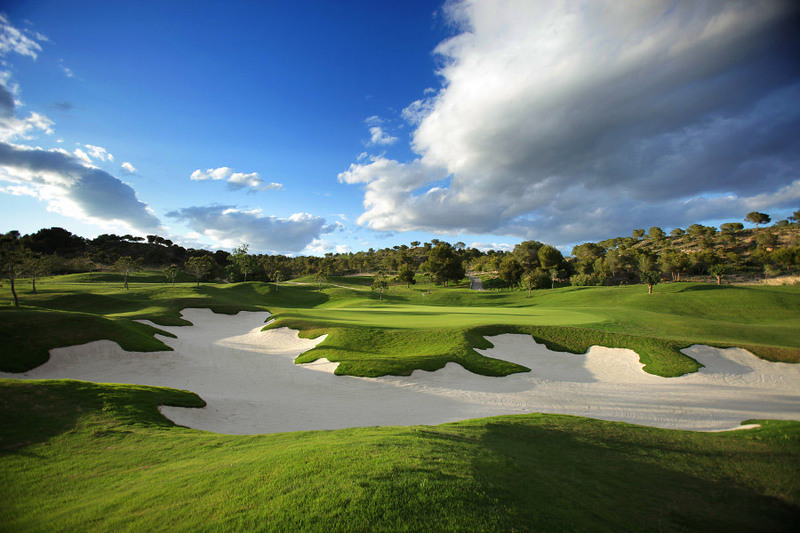 The golfing facilities, available at Las Colinas Golf Resort & Country Club, are second to none, and are some of the best to be found anywhere in Spain. Golfers can enjoy the manicured natural grass driving range, as well as a large putting green & short game area. Las Colinas Golf Resort, also offers guests complimentary, TaylorMade practice balls, and benefits from the latest ultra high speed video analysis, taking golfing lessons and technology, to a whole new level, and enabling them to offer golfers a more detailed analysis of their swing, than ever before. Las Colinas Golf Resort & Country Club, owners and guests, can also take advantage of the exclusive Beach Club, Set on the cliff’s at the edge of the blue flag beaches at Campoamor. Here you can relax and unwind by the beautiful infinity pool, with outstanding views of the mediterranean ocean. There is also a great range of food, drinks, and cocktails to enjoy, on the day beds around the pool. Back on Las Colinas Golf Resort, there are a selection of, children's play areas, Communal swimming pools, Tennis & Padel courts. To keep you entertained. As well as a Gym, club house bar, & restaurant, off road cycle paths, and the beautiful communal landscaped gardens to walk around and enjoy. Las Colinas Properties For Sale. For people wanting a the ultimate in privacy, seclusion, and modern design there are a stunning selection of, Las Colinas properties for sale, from Apartments to Villas. All set in their own communities, on this vast resort. The Apartments for sale on Las Colinas Golf Resort, which have been carefully thought out in their position, sit to the back of the resort, on a high section of land. This gives these properties, a unique view of the whole of Las Colinas Golf Resort, and right out over the forest to the mediterranean ocean. Each of the stunning Apartments, have been built by only a small selection of Spain’s best developers, and come finished to the highest of standards, With stunning interior design features, and the most up to date technology. When it comes to Las Colinas properties for sale, The Las Colinas Golf Resort Villas for sale, are amongst, some of the most spectacular properties to be found, anywhere in Spain. There are again only a small selection of hand picked developers working within the resort, all of whom offer some simply stunning homes. Each developer brings their own unique twist to the properties on the resort, from infinity pools that overhang the villa’s, to the interior designs from Armani and other leading brands, designers and architects. Around Las Colinas Golf & Country Club, The resort has been divided into small communities. As well as the main gate, which has 24 Hour Security, each of the communities within the resort, is also gated, adding another layer of privacy. Each of these communities is small, and has a low density of properties within them, making them exclusive and peaceful. There are also future plans in place, for Las Colinas Golf Resort, To include a 5 Star boutique hotel, small commercial centre, complete with designer shops, and further facilities, all helping to enhance this amazing resort. To Find out more about this exclusive resort, there are a selection of links below, to articles, Las Colinas website, Our range of Las Colinas Properties for sale, and more.